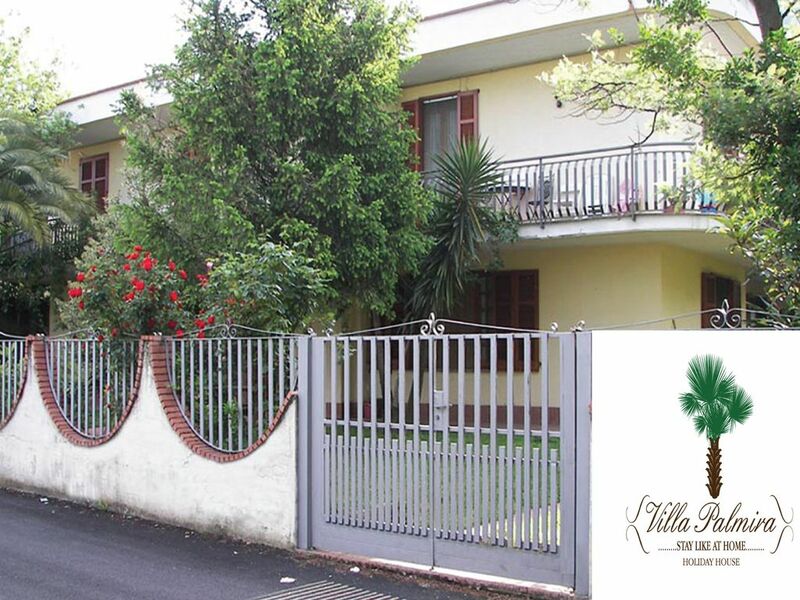 Avellino Apartment in a quiet and safe hillside village - "Villa Palmira"
Casa De Simone is a spacious and cool villa. Located on the ground floor of our two-family villa is the vacation apartment consisting of a large, live-in kitchen with fireplace, TV and sofa, two bedrooms and two bathrooms. The friendly owners live in the upper floor apartment and are always on hand to provide any assistence. For your comfort, there's lawn furniture in the beautiful garden with shady trees surrounding the house. Also, the entire property is enclosed by a small wall topped with ornamental iron. Independent garage parking for your car is also available. The owners take pride in this apartment assuring maximum comfort and, above all, cleaniness. Children and pets are welcome and will enjoy the house and area. Located just 30 minutes from Naples Airport and Central Train Station, right off the Baiano exit of the A16 highway. This is a great base for exploring all of the world renowned sites like Mount Vesuvius, King's Palace of Caserta ,Shrine of Santa Philomena,Pompei, Sorrento, Amalfi Coastline etc. Everything about Villa Palmira is so wonderful. The Villa is located about 30 minutes from Naples and sits in the middle of the region of Irpinia. The central location is perfectly situated for visiting many places around southern Italy. The Villa itself is clearn, very well equipped and sits in the small village of Quadrelle, the epitome of a quanit Italia village. You can walk to the little town center in about 10 minutes and there are several yummy pizzerias very close by. I would recommend renting a car so you have the opportunity to visit the myriad of amazing sights in the area, for example, Taurasi, Montemiletto, Avellino, Baiano, Pieradefusi and Paternolopi to enjoy the stunning views and of course taste the amazing wine and food of Campania. Giovanni and his parents are the most charming and generous hosts. They offer many services such as a ride from Naples airport and geneaology expertise. I was a solo traveler doing research on my family roots, and I always felt safe and learned a great deal about my ancestors. Giovanni and his parents live in the home just above, and were always available for questions and travel advice. There is a well equipped kitchen in case you like to cook as well as a large bedroom with comfy bed and lots of light and fresh air. I recommend this villa very highly and can't wait to return! Just a short walk up from Mugnano del Cardinale, this rental has many options up to 2 bedrooms, 2 full bathrooms, and full kitchen. Much quieter here with a gated yard for the kids who were graciously invited to an afternoon art/music class by our host Giovanni. which they thoroughly enjoyed. Although we did not eat here as we were visiting family, the kitchen was well appointed and the home very clean. This was the perfect place for us. Thanks for a great stay! I loved staying in this quiet, safe, clean, friendly apartment. It was exactly where I needed to be to walk to my destinations easily and safely. I had full use of a shared kitchen and my own bathroom. The owners were always so helpful. Wonderful attractions were within an hour away by car or train. I hope to return next year, and I have already recommended it to friends. The services offered by both Joe and Giovanni were extremely thought out and professional. We booked them for one service and ended up booking a second service after. If you need very courteous and informed tour guides, please consider hiring them for all your needs. Very happy! Our lovely stay- the most gracious "Villa Palmira"
We enjoyed our stay in Avelino/Naples area in large part due to the delightful, 2-bedroom, 2-bathe apartment with a very large kitchen/dining-great room, all very clean and well-appointed in the Villa Palmira of our host and his lovely wife. Most of all, in addition to the very comfortable and charming apartment our host and his family acquainted us with local amenities, routes to take--basically all necessities for ease in getting around--all in English! Our host and his family went above and beyond, inviting us to the Chestnut Festival for a taste of the spirit of Avelino. I will definitely return here and highly recommend Villa Palmira to relatives and friends--indeed already have done so! This property was everything that one could ask for! The listing is completely accurate, well maintained and the owners really know how to make one feel at home. The owners are extremely generous and always willing to help with whatever is needed. Being that this was my first time traveling to Italy I had a general idea on what I wanted to experience there and the owners were helpful to make the trip a memorable one by giving some input on possible trips each day we were there. Its safe to say without the exceptional hospitality this trip would not have been as great as it was. Quadrelle is located at the 'Baiano' exit of the A16 Motorway, 25 kms east of Naples on the border between the provinces of Naples and Avellino in a semi rural area surronded by amazing landscapes. Easy driving distance to Naples Airport, and Avellino, Salerno, Benevento, Caserta. Easy daytrips to Pompei, Mount Vesuvius, Amalfi Coastiline, Paestum, Cilento, Sorrento and more. Isolated from noise and pollution . Only 300 meters away you can walk to the nearby stores or Italian Pizzeria. There is a Barbecue area and lots of garden space to picnic outside.